High Risk LifeI nsurance Agency can assist you with Life Insurance Approval with Megacolon! Have you been declined for life insurance due to Megacolon? Can I Qualify for Life Insurance if I have Megacolon? Yes, most individuals with Megacolon will be able to qualify for traditional life insurance, the type of insurance which requires a medical exam. Best Case Scenario – Best cases of Megacolon are those that have been diagnosed early, surgically treated and has then recovered. These cases will qualify for the “Standard” rating. Click here for quote at “Standard”. Moderate Case – Those cases that does not require an operation but have mild symptoms of abdominal distention and tenderness may qualify for the “Mild Substandard” health class. Click here for a quote at “Mild Substandard”. How many years have you been diagnosed with Megacolon? Megacolon is manageable condition especially if detected early and given appropriate management. Most cases due to congenital conditions that have been operated early usually have very good prognosis. These cases usually qualify for the best rating at “Standard” health class. Mild to moderate cases that do not require surgery may qualify for “Mild Substandard”. Symptoms of abdominal pain or bloating may be signs of a worsening condition that may require surgical management. These cases will have to wait at least after a year of recovery before an appropriate rating can be determined. There are certain medications that can aggravate your condition such as antipsychotic drugs. It is important to disclose all the maintenance medicines you are taking so the medical doctor can evaluate properly and give an appropriate rating. Regular visit to your gastroenterologist is a good sign of control of the condition and may get you the best rating. It is, however, necessary for laboratory and surgical records to confirm the absence of complications such as the presence of a hard mass in the colon or a toxic case of Megacolon. Recent laboratory or diagnostic tests such as x-ray, ultrasound or colonoscopy is the best way to assess your actual condition. This may also confirm your compliance with your physician’s management. Megacolon is a condition of the large intestine where it grows wider and dilates massively. It can be congenital, which is called Hirschsprung disease or it can be an acquired condition from other medical conditions. In cases of congenital Megacolon, the large intestine lacks enough nerve fibers that are needed for the involuntary mscle movement (peristalsis). As a result, the body wastes are not pushed forward and out of the body. The normal area of the intestine works double time to push the waste contents out. As this continues, the part of the intestine that works hard becomes enlarged, dilated, distended and thickened. This causes the symptoms of severe constipation and distended abdomen in children. Acquired Megacolon, on the other hand, may be the result of poor toilet training or an emotional or psychological condition in children. In adults, Megacolon can be secondary to other medical conditions like diabetes mellitus, amyloidosis, thyroid problems and scleroderma. In other cases it is due to the side effect of some drugs like Risperidone (antipsychotic drug). Signs and symptoms of Megacolon include chronic constipation, abdominal tenderness or pain, bloating and presence of abdominal mass upon palpation. In severe cases of megacolon, increased heart beat, fever and low potassium level is observed. In more serious cases where ulcers have occured, intestinal perforations can lead to severe sepsis infection where the risk of death becomes high. Other conditions causing Megacolon include Chaga’s disease and intestinal amoebiasis. Toxic cases of Megacolon, on the other hand., may be caused by ulcerative colitis, inflammatory bowel disease, Crohn’s disease and pseudomembranous colitis, cytomegalovirus and HIV/AIDS. 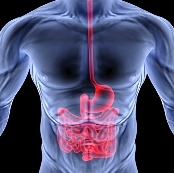 See all our other article on the Digestive System and Click Here!